It has been a while since I read a book by Anita Shreve for some reason but I enjoyed this book just as much as her previous novels. 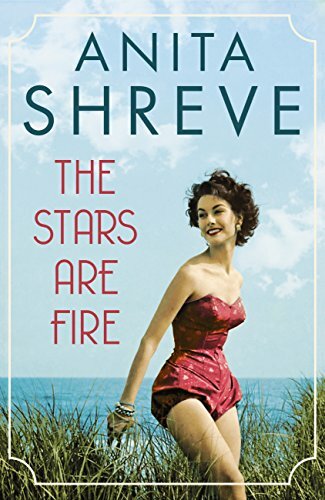 Inspired by a devastating wild fire which swept through Maine in 1947, The Stars Are Fire tells the story of young wife Grace and how she and her family cope in the aftermath of the fire. Grace is married to Gene and it’s not a particularly happy marriage. Gene is prone to mood swings and does not show much love or affection towards his wife. They have two children, Claire and Tom, and Grace is pregnant with their third child when the fire strikes leaving her with no possessions, no home and, as Gene has not returned from fighting the fire, effectively a single parent. What I really enjoy about Anita Shreve’s books is that although they may initially appear relatively straightforward, she brings great depth to her characters and especially to their emotions. You quickly become invested in their lives and concerned for their well-being. Although put in a really difficult position when on her own with her family, Grace in fact proves herself to have great resourcefulness and resilience. It was heartening to see her drawing on her inner strength, strength she probably didn’t realise that she had. “Don’t worry about me, Mother. I’ve discovered, ever since the fire, or maybe more recently, that I have inner resources I can count on.” When she has a chance at happiness, I was so pleased for her as she certainly deserved it Yet that time of happiness was so brief, would it be enough to sustain her through the extremely testing times that followed? I really wanted Grace to have the chance to break free and have the happiness she so deserved. Without giving anything away, I liked that the ending had a hint of optimism for many of the characters, yet everything wasn’t completely wrapped up neatly. The reader had to make up their own mind to a certain extent about just how life would work out for everyone. I felt that Grace’s life very much reflected the classical music she so loved “what strikes her now is how tumultuous the piece is, how often that tumult is followed by moments of quiet. It’s the combination that creates the beauty.” It is these times of tumult and moments of quiet throughout Grace’s story which make this such a wonderful book to read. Hot breath on Grace’s face. Claire is screaming, and Grace is on her feet. As she lifts her daughter, a wall of fire fills the window. Perhaps a quarter of a mile back, if even that. Where’s Gene? Didn’t he come home? 1947. Fires are racing along the coast of Maine after a summer-long drought, ravaging thousands of acres, causing unprecedented confusion and fear. Five months pregnant, Grace Holland is left alone to protect her two toddlers when her difficult and unpredictable husband Gene joins the volunteers fighting to bring the fire under control. Along with her best friend, Rosie, and Rosie’s two young children, the women watch in horror as their houses go up in flames, then walk into the ocean as a last resort. They spend the night frantically trying to save their children. When dawn comes, they have miraculously survived, but their lives are forever changed: homeless, penniless, and left to face an uncertain future. As Grace awaits news of her husband’s fate, she is thrust into a new world in which she must make a life on her own, beginning with absolutely nothing; she must find work, a home, a way to provide for her children. In the midst of devastating loss, Grace discovers glorious new freedoms – joys and triumphs she could never have expected her narrow life with Gene could contain – and her spirit soars. And then the unthinkable happens, and Grace’s bravery is tested as never before. This is a lovely review, sounds like a good read, will keep a wee eye out for this author, not sure I have read her or if I have it has been a long time. Thanks Lainy. I love The Pilot’s Wife and Fortune’s Rocks if you wanted to try an older one. Great Review Joanne. It was a really fab read. I loved The Pilot’s Wife and The Stars Are Fire is just as good. Lovely review, Joanne. The Pilot’s Wife was the first of hers I read but I love Fortune’s Rocks too.